Injuries to the shoulders are one of the most common injuries that can occur, usually due to heavy lifting, active sports or even aging. These injuries could range from dislocations to torn ligaments to broken bones in the shoulder joints. The best way to handle a shoulder injury is to see a Doctor to get an X-ray and full evaluation done. 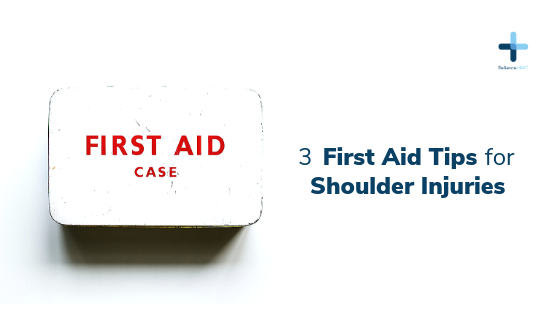 In the meantime though, if you do have an injury, you can follow these simple first aid steps to help you manage the pain. 1. Rest the shoulder – Using the arm which is affected is not a good idea and needs to be avoided. If your job involves manual labour, it is advised that you stay at home to rest. 3. Support the shoulder – Wearing a sling is extremely important and should not be taken lightly at any point of time. You can make a sling from a scarf or any long piece of cloth. A good support will ensure there is no further injury to the shoulder and helps it heal faster.